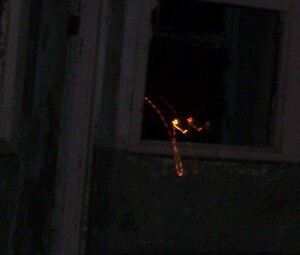 Ghost Hunters of Asheville sometimes gets streaks running across their photos. Usually reddish to orange in color, guests will sometimes capture a single streak; others discover many streaks racing across their picture. Paranormalists are familiar with this phenomenon -- as are skeptics. Believers report the streaks are typically uncovered at night or indoors and are found in paranormal hot spots. In our years of touring, we've found that individuals who have higher paranormal sensitivity tend to get streaks, apparitions and mist. These same people seldom get orbs. Conversely, the guests who capture a lot of orbs never get the streaks. According to the organization Paranormal Study & Investigative Reseach Organization, squiggles and streaks "are caused by small objects caught on camera while it is in Night Mode or even if it just has the flash turned off." With Night Mode (or the flash turned off) the camera's shutter is open to capture any available light. The slightest movement -- including one's heartbeat or breathing -- can cause blurring and/or streaking to occur. This image was posted on PSIRO's site as an example of similar photos that many people send to them as evidence of spiritual or paranormal activity. Notice how the wall and window sill seems to be completely in focus. The organization's conclusion: The streaks are due to "low shutter speed and low lighting. The light streaks themselves can be caused by a number of variables from reflections of camera flash, red eye reducer, unnoticeable lights and reflections. The cause of the streak is simply the camera moving from shaking hands or walking about." Sounds reasonable, logical, maybe even probable. But how, then, to explain the below photo? These streaks aren't even the "right" color. For us, the jury is still out.